When I was at Ford last month, we had some discussions about using mobile devices to monitor your electric car efficiency, battery life and even just turning it on and off. Or using your smartphone to control various aspects of your house. This is why I love technology so much. Yes I kind of have a slight gadget obsession, but it's not just the gadgets that I enjoy. Technology keeps getting better and giving us the ability to do Jetson type of cool stuff like home automation. What is home automation? Home automation gives you automatic and remote access to devices in your home. Just how cool would it be to dim your lights from your mobile device? Adjust the heating temperature before you get out of bed because there is nothing worse than climbing out from your warm bed into frigid air. No thank you. Home automation not only provides convenient ways to do and monitor things around your home, it also helps with energy efficiency and home security. Nowadays with home security systems like Vivint, you get security, efficiency and automation all rolled into one package. You get the security items you would expect like window and door sensors and motion detectors but then you also get a smart thermostat, lamp and appliance controls and more. It is so very cool and I want it. But I suspect that I might need a more updated house first. I don't even have central air conditioning, which stinks since as I type this at 11:45 PM the "feels like" temperature in my area of Connecticut is 85 degrees. Although I suppose I might be able to use the appliance control feature to turn on each of the window units throughout the house. That can certainly be a pain. But someday when I do get central a/c, and I promise you I will if it is the last thing I do, I want a smart thermostat with home automation to help me control it and everything else. Mainly for energy saving purposes since we all know how being "green" is important to me. But also because it is just pretty cool. 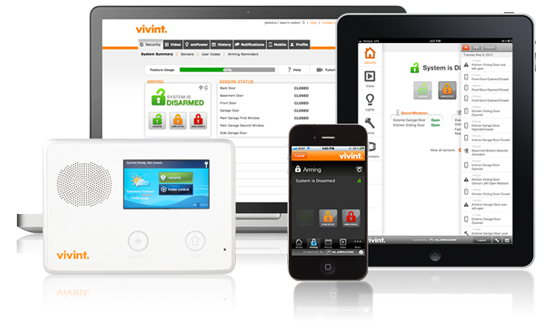 This post has been brought to you by Vivint.